Protecting security for an online merchant is of utmost importance as it directly affects all activities of that business. A weak security protection may lead to the risk of being attacked by hackers, which can possibly result in losing reputation, depleting finance, and so on. Therefore, Our Security module is developed to put a hand to help business doers to cope with this problem. With numerous outstanding features, the possibility of being hacked is limited at the minimum level. Especially, with Away Mode function, shop owners can put a restriction on time to access to admin page; therefore, the security system is much protected. Away Mode is a function which allows store owners to set certain restricted time for any access to their store’s admin page. It means that, during that time, no one can login admin page even their IP addresses and passwords are correct. Therefore, with this function, store admins can prevent unusual login to their page out of working time. Another function of Security extension that supports login management is Login Log, which records all login attempts made within the store. Therefore, admins can easily notice unusual Ip addresses with so many failed login attempts. Explore. To configure this function, store admins can start from Admin Panel, then access Mageplaza > Security > Away Mode. On the result page, store managers have to select Yes in the Enable field to activate this feature. After that, other sections will be shown to admins for their personal configuration. 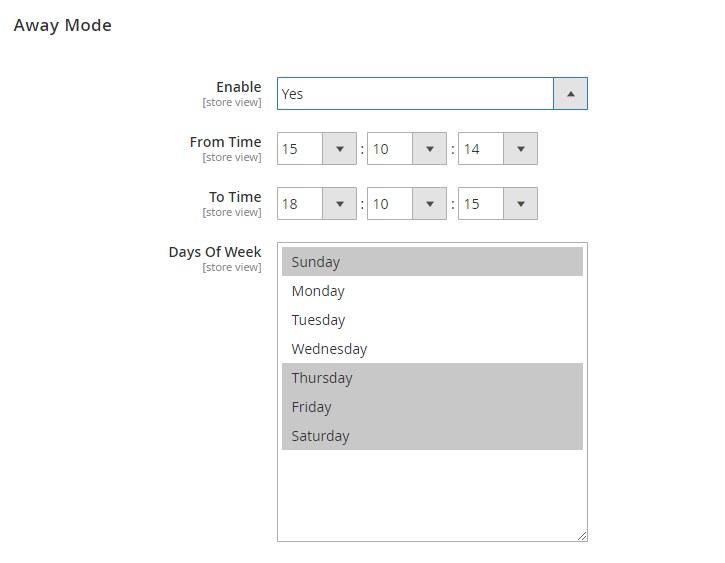 This feature includes two ways to set a limitation to access time which are by hours or by days. Store admins can choose to limit login time by modifying a specific period of time every day or/and specific days in a week. If store owners want to put a restriction on login attempts every day, they can adjust time in two fields From Time and To Time. For example, when admins want to prevent access from 6.pm to 8.am on the day after that, they have to fill in 18:00:00 in From Time field and 8:00:00 in To Time section. Three option boxes are hour, minute, and second respectively so that admins can easily personalize limited time here. In case users expect to against access from any IP address on certain days, they can click on any day from option list]. They can choose more than one day to apply for their stores. For instance, Saturday and Sunday are two days that managers do not want to have any login to admin page, they can select these days from the list. In some cases, shop owners want to access their admin site when the system is already in Away Mode, they can follow these steps. First, they need to apply the command “bin/magento security:reset”. After that, use another command “bin/magento cache/plush”. By taking these actions, admins will reset their Away Mode so that they can login as the restriction has been abandoned. After signing in admin page, store owners can adjust away mode again.